9/16" x 1-1/4" Worm Drive Clamp | U.S. Plastic Corp.
Clamps are tine, tough and precision engineered for use in small hose applications. 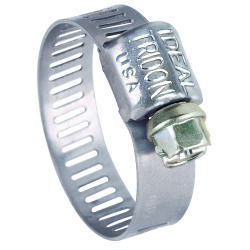 Slim 5/16" band and low profile housing make them easy to install in confined areas. Screw has a 1/4" hex head. Micro-Gear 62M clamps are all 300 grade stainless steel marine grade clamps. Installation torque is 10 to 15 in-lbs. All sizes are listed minimum x maximum range of clamp.